Whether you’re making plans with friends, ordering food, or setting the temperature on your thermostat, smartphone and tablet technology make everyday tasks faster and easier. New Intel® Xeon® Scalable processor-powered 14th generation Dell EMC PowerEdge™ servers powered by Intel® Xeon® Platinum processor with iDRAC Quick Sync 2 technology bring these automated advantages to the datacenter, too. 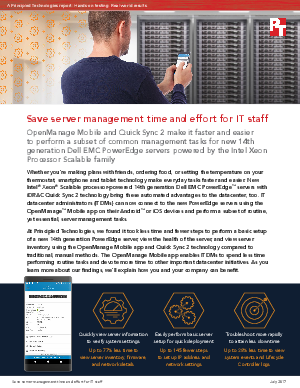 IT datacenter administrators (ITDMs) can now connect to the new PowerEdge servers using the OpenManage™ Mobile app on their Android™ or iOS devices and perform a subset of routine, yet essential, server management tasks.